A detached bungalow set in a cul de sac location. 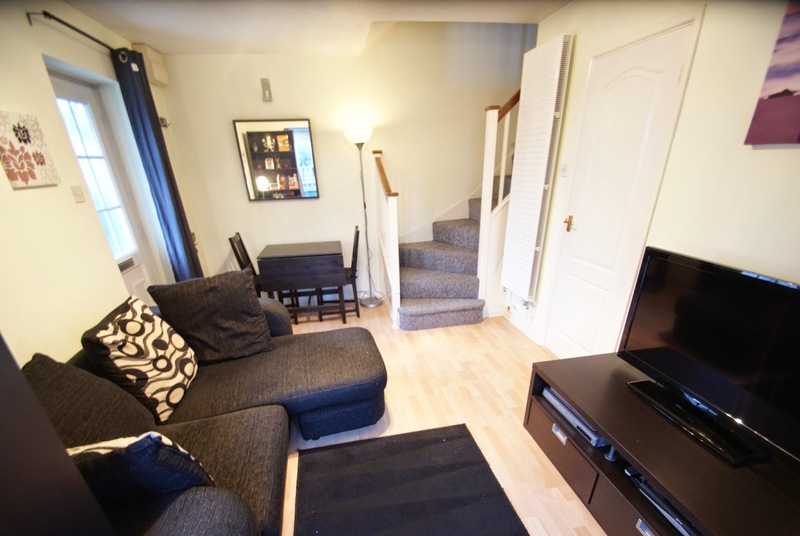 Comprising on two double bedrooms, lounge/diner, bathroom and extended kitchen/diner. Large gardens, with garage and a drive with parking for several vehicles. All round uPVC fascias and guttering, and cavity wall insulation. The garage roof was recently replaced with EPDM, and the central heating boiler was replaced in 2012. This property has potential to extend into the roof, or further extend into the rear garden (pending planning permission). Kingskerswell offers a range of amenities including a co-op store, hair salons, Post Office, bus stops, schools, churches and health centre with pharmacy, all within walking distance of the property. We spotted this on Facebook - we thought we would share it with you! An Extended Detached Bungalow in a generous plot | Reception Hallway | 19ft Lounge | Dining Conservatory | Kitchen/Breakfast Room | Utility Room | Shower Room | 3 Double Bedrooms | Family Bathroom/W.C | Gas Central Heating | Double Glazing | Garage & Driveway Parking | Large level rear garden | Some fine sea views | Requiring some modernisation | no Chain | Viewing Recommended. This extended and spacious three bedroomed detached bungalow occupies a residential position within the sought after Preston area of Paignton and within approximately one mile of shops and facilities at Preston and also Paignton town centre which offers a fine and varied range of shopping facilities and amenities, beaches, harbour, railway and bus station. Features of the accommodation which has been a well cared for home and now requires some modernisation include reception hall with doors to principle rooms, fitted kitchen/breakfast room, good sized lounge overlooking the rear garden with doorway leading to the uPVC double glazed dining conservatory. There are three double bedrooms all with built-in wardrobes (two having sea views) and there is a family bathroom/W.C plus separate shower room/W.C and a useful utility room. Outside there is driveway parking leading to the attached garage, a level lawned front garden whilst to the rear of the property is a large garden extending to approximately 90 ft in length, being level and arranged mostly to lawn. An internal inspection of this gas central heated and uPVC double glazed property is highly recommended to fully appreciate the size of the accommodation and the further potential on offer. I received a very professional and efficient service at all times. I was kept informed of what was going on and always received a quick reply to any query raised. It was also nice to received the little plant from the team. It was another little touch that shows you think that little bit further and after the sale has been made. It was also good to have the website links for moving preparation, who to tell I've moved etc. A link-detached bungalow in a cul-de-sac location in the popular village of Kingskerswell. The accommodation has been extended to comprise entrance porch, entrance hall, sitting/dining room, two double bedrooms, kitchen, bathroom/WC and the garage has been converted into a utility room. Also on the first floor is a useful loft room. Outside are front and rear gardens as well as driveway parking. An internal inspection is recommended in order to appreciate the accommodation on offer. We have just exchanged contracts with our buyers and the rest of the chain after what has been quite a long drawn out process through no fault of our own. I just wanted you to know that the above 2 gentlemen acted in an exemplary manner throughout. They were both super efficient, continually pro-active and restored our faith in a professional body that everyone else seems to constantly berate. They were the only ones who kept us in touch with what was happening when solicitors, surveyors, other estate agents, etc let us down on a regular basis. They are an amazing team who I am sure will go far. We will certainly be singing their praises and that of Williams Hedge as a whole to everyone we know. It is thanks to them that we got through one hell of a stressful time all round. Many thanks to Williams Hedge, but especially to David and Chris. I wanted to write to you to express my sincere thanks to you especially, and also your colleagues David and Ellie at the Williams Hedge Kingskerswell office, for the marvellous professional help and service we have had from you in achieving the sale of our rental property in Torquay. From start to finish the exceptional quality that we have experienced with you and has prompted me to write this is beyond all the usual aspects you have time and again gone the extra mile in terms of your level of communication, making phone calls and sending emails way beyond the usual working hours to keep us informed and to keep the transaction moving in the right direction. Without all of your effort and astute advice I am confident that we would still be waiting to exchange contracts ! We wish you all the very best with the future development of the business. A well maintained two bedroom detached Bungalow standing in a generous plot situated in Mid-Preston in sought after residential area. The property comprises of Lounge, Kitchen/Breakfast Room, Two bedrooms and Bathroom. Externally the corner plot gardens are well tended and incorporate garage and parking. To the right hand side of the property is a large area of garden (approx. 52'x46') which subject to necessary consents could be utilised to substantially extend the property or the possibility of a further separate dwelling (see agent note to end of details). 1930s’ Four Bedroomed Detached House with large lower ground floor room making ideal facilities for extended family/teenager/possible annexe accommodation | Entrance Porch | Large Entrance Hall | Lounge | Second Lounge/Reception | 19ft Kitchen/Dining Room | 4 Double Bedrooms | Bathroom | Separate W.C | Lower Ground Floor Utility Room (conversion to full kitchen for potential annexe) | Lower Ground Floor Room (currently utilised as an office) | Adjacent Conservatory | Front Garden | Driveway Parking for 2/3 vehicles | Double Garage | Room to the rear garage currently utilised as a bar/garden room | 60ft by 45ft Rear Garden | Gas Central Heating | Double Glazing. An opportunity to acquire a substantial Detached Family Home with flexible accommodation situated in a level virtual level location to local shops and amenities at Preston. The main accommodation comprises of a generous Lounge, 2nd Reception and 19' open plan Kitchen/Dining Room, on the first floor are four double bedrooms and a bathroom. The cellar has been converted and is accessed under the stairs of externally via the Conservatory. It is currently utilised as a home office with utility room off. However this area could be converted to form Annexe accommodation/playroom or would make good bedsit style accommodation. Externally the plot incorporates double driveway parking and a double garage with additional useful room behind (suitable home office etc) which is currently a novelty bar. The gardens are attractive and level from the rear and enjoy a good degree of daytime sun. A well-presented terraced property enjoying a cul-de-sac location on the edge of the popular village of Kingsteignton. The property would male an ideal investment/first time buy, and an internal inspection is highly recommended. The accommodation briefly comprises sitting room with double doors opening onto the enclosed garden, kitchen, first floor landing, one double bedroom and bathroom/WC. The property is further complimented with mostly double glazed windows and gas central heating. Outside, the property has an allocated parking space and ample visitor parking, front garden and an enclosed rear garden, which is accessed from the sitting room. Kingsteignton is ideally located for ease of access onto the A380 for Exeter or Newton Abbot with its main line railway connection for London/Paddington. Kingsteignton itself offers a range of amenities including primary and secondary schools, local shops and retail parks, sports grounds and playing fields. This extremely well presented 2 bedroomed semi-detached bungalow occupies a residential position close to local range of shops and bus service which connects to the town centre of Paignton which is approximately 1 mile distant. The town centre offers a wide and varied range of shopping facilities plus beaches, harbour, railway and bus station. The well proportioned accommodation also offers great potential to extend in to the loft area and briefly comprises of reception hallway, bay windowed lounge with feature fireplace, dining conservatory, fitted kitchen, 2 double bedrooms, bathroom/w.c. Outside there is driveway parking plus mostly lawned front and rear gardens and the property does enjoy some distant sea views. An internal inspection of this gas centrally y heated and double glazed property is highly recommended to appreciate the accommodation on offer. A Superbly Presented Split Level Bungalow with spectacular sea and valley views | Reception Hall | Lounge | Dining Room | Sun Lounge/Conservatory | Fitted Kitchen | Utility/Store Area | 2/3 Bedrooms (one used as study) | Bathroom/W.C | Separate W.C | Gas Central Heating | UPVC Double Glazing | Garage | Off Road Parking Bay | Superb Landscaped Gardens | Superb views over Clennon Valley and out to sea | Viewing Highly Recommended. 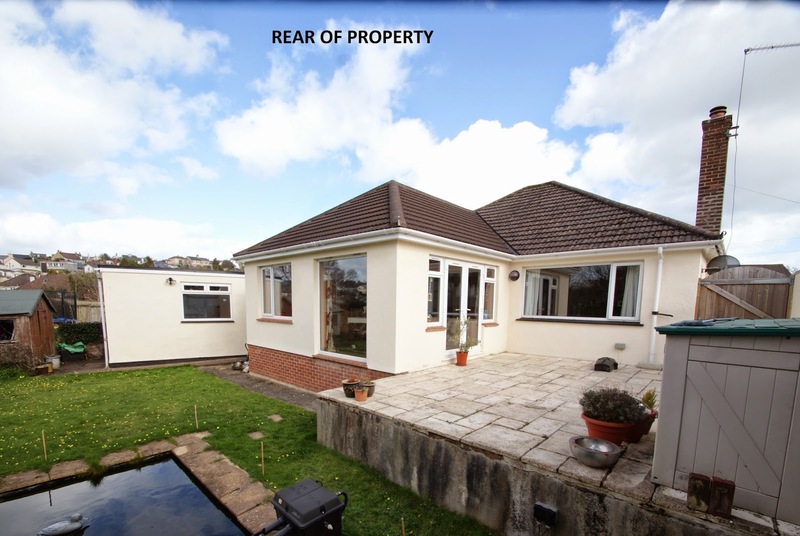 This superbly presented individual split level bungalow occupies a residential position within a few hundred yards of Clennon Valley, ¼ of a mile of Goodrington beach and approximately one mile from Paignton town centre which offers a wide and varied range of shopping facilities and amenities, beaches, harbour, railway and bus station. Features of the accommodation which is a credit to the owners include easy access to the front door with reception hallway, double aspect lounge with fine open and sea views, dining room, sun lounge again affording exceptional views, modern fitted kitchen, useful utility/store area and on the upper level there are two bedrooms plus quality bathroom/W.C and separate W.C. A few steps up lead to the study/third bedroom which again affords spectacular views over the valley and out to sea. Outside there is a garage at road level plus additional parking bay, extremely well cared for and landscaped gardens to both front and rear with the rear garden having raised near level lawned sections and again enjoying some stunning views. An internal inspection of this property which is a credit to the owners is highly recommended to fully appreciate the accommodation on offer.